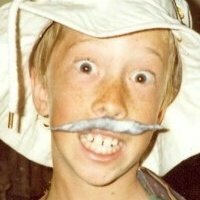 As much misspelled words as your probably accustom to when ready my blog "Movember" was not one of them. The Movember campaign is simple, grow a mustache for prostate cancer awareness. "The 'Mo', slang for moustache, and November come together each year for Movember. Each Movember we challenge men to change their appearance and the face of men's health by growing a moustache. The moustache is our ribbon, the means by which we raise awareness and funds for cancers that affect men. Much like the commitment to run or walk for charity, our commitment is to grow a moustache for 30 days. Funds raised benefit the Prostate Cancer Foundation and LIVE STRONG." And having only recently finding out about said campaign I'm really bummed too. My wife [hates] facial hair on me but from time-to-time I endure the rolling eyes and 'hurumphs' for some whiskers for a while, and had I known I could have blamed, I mean supported, prostate cancer awareness I would have been all over it! You must have a mustache to have enjoyed the movie "Stroker Ace"
You must have a mustache to slap a man with a riding glove and "demand satisfaction"
Posted on November 17, 2010 by Justice Mitchell and filed under Fashion Cents, Soapbox, Trends and tagged Mo awarness facial hair mustache prostate cancer.